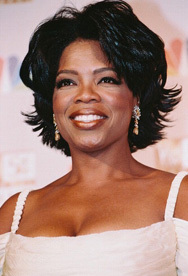 Oprah Winfrey is one of the most popular talk show hosts in American television history. As her show enters its 21rst season, she has millions of viewers who tune in each day. One of her most popular segments is her "Favorite Things" holiday show. During this show, Oprah shares with the studio and television audience some of her favorite things including jewelry, gadgets and vacation getaways. People love this show because on the "Favorite Things" episode, audience members get the extravagant gifts that Oprah displays. Around 300 audience members are showered with gifts each holiday episode. The amount varies, but Oprah audience members can each expect to receive between $4,000 and $15,000 worth of gifts. But, Oprah is a big winner as well. The 2004 episode of "Oprah's Favorite Things" had the highest ratings ever for a "Favorite Things" episode and was the second highest rated episode for the season. Oprah has been doing her "Favorite Things" episode since 1999. Guests received a set of Illumination Ritual Candles, each one to inspire different feelings like love, peace and passion and each candle contained a tiny gemstone inside. The 12-candle set was valued at $169.95. Dog owners were no doubt thrilled with the Fifi and Romeo Pet Clothing ($150 and up) - one of Oprah's favorite things of 1999. One of the most extravagant gifts that year was a Susan Abbott Personalized Painting, ranging from $5,000 and up. Oprah loved the Susan Abbott painting given to her by author Sarah Ban Breathnach. In 2000, Oprah added many hi-tech gadgets like the Motorola Talkabout pager (priced at $179), so audience members could receive email while on the go. Another favorite thing from 2000 was the book equivalent of the iPod, the Gemstar REB1100 eBook from RCA ($299). The Gemstar let users download up to 8,000 book pages, so they never had to carry around a book again. The BlissLabs Glamour Gloves ($44) and Gel ($22) was one of Oprah's favorite things in 2002. The Panasonic 4-in-1 Digital Camera from Frontgate ($449) was also a big hit that year. The camera, the size of a credit card, takes pictures and video, but can also be used as a MP3 player and audio recorder. In 2003, Oprah decided to do two episodes of her favorite things segment - one in the Spring and one in the Fall. Spring audience members got an Apple iPod ($399), Silhouette Minimal X Sunglasses ($175-$250), and a Hewlett Packard Digital Camera, Printer and Dock (total value $730) among other items. Fall audience members racked up with UGG Classic Short Boots ($110), a Philip Stein Teslar Watch ($595), and a Sony DCR-DVD200 Handycam ($1000). 2004 was a very special Favorite Things segment for Oprah. She convinced 300 teachers to attend her show, under the premise of talking about education and a teacher's daily routine. Instead, she surprised them with the Favorite Things episode. The teachers received gifts such as a Sony VAIO S260 notebook computer, a Dell 30" wide-screen LCD television, a Maytag Neptune Top-Load Washer and Drying Center, and a trip for two to the exclusive Miraval Resort and Spa. Total gift amount for each teacher was about $15,000 - much more than the previous year total of $4,800. Oprah, a supporter of education and teachers, knew the teachers were worth every penny. In 2005, Oprah decided to make her favorite things audience up of Katrina relief workers. Among the gifts were Sony VAIO® FJ Notebook, Kashwére® Shawl Collar Robe, BlackBerry 7105T from T-Mobile, and a couple of Oprah's favorites from 2004, UGG Australia's Uptown Boot and an Apple iPod. While considerably less than the year before, the 2005 recipients still received over $7,000 worth of items. Probably due in part to Oprah's television audience as well as her personal appeal, each year the manufacturer's of the items found on Oprah's favorite things donate all the gifts. But they reap great benefits from doing so. They get television exposure and an immediate increase in sales after each episode. Companies like Sephora and Macy's have both publically stated that as soon as Oprah mentions one of their products, people are coming in the stores in droves to get it. So in the end, it is a win-win situation. The manufacturers see increased sales, the audience gets great gifts, and Oprah just keeps on getting more and more popular with her viewing audience. Shelley Lowery is a successful writer with an interest in celebrities like Oprah Winfrey. She demonstrates the power of Oprah's Favorite Things list each year on the holiday shopping season. http://www.oprahs-favorite-things.com.